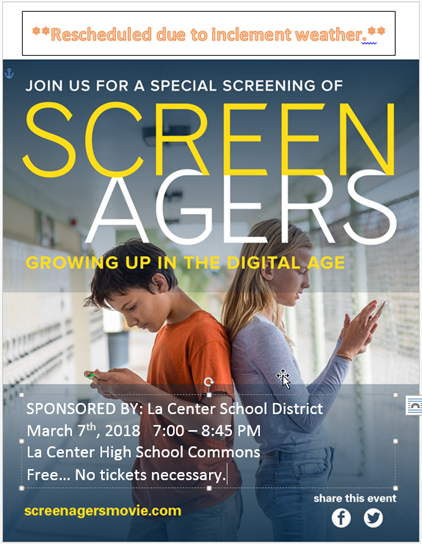 “Screenagers – Growing Up In the Digital Age” is a powerful documentary depicting the way millions of teens struggle with phones, games and technology in general. The film offers solutions on how we can help kids navigate the digital world and provides practical tips for raising happy, healthy technologically empowered teens. Sponsored by the La Center School District, the film will be shown on Wednesday, March 7th from 7:00-8:45 pm at the La Center High School Commons. Admission is free. Watch the official Screenagers 2017 trailer and a Google Talk interview with Dr. Delaney Ruston, Stanford-trained physician, who wrote and directed the film.